This last part of an article first published in the June 2016 issue of the MultiLingual magazine, presents some practical examples of the application of risk management policies in the language industry. A few concrete cases are included here as example of risks to be found, as well as their possible remedies. Non-linguistic examples have been selected, as experience shows that people in the language industry tend to overemphasize the linguistic aspects of life. Remedy: Scams are a typical case for avoidance. Check the fraud-prevention information available at http://www.proz.com for a comprehensive coverage, but in a nutshell you should possess a general knowledge on how scammers work, always request verifiable contact information from any possible client or provider, and take steps to verify those details yourself. Remedy: To reduce the probability, keep an eye on signs of impending problems within the customer (comments from the client, news, social media comments) or lack of client satisfaction (client wants some service you do not provide, comments about your service, quality or prices). To reduce the impact, no single client should represent more than 25% of your work. Remedy: Keep money reserves or a line of credit for dry periods. Develop a network of trusted providers to outsource extraordinary peaks of demand. Consider collaborating with colleagues (if you can turn a competitor into an ally, they may also share with you their own overflows). Remedy: Create redundancy in your infrastructure. Contact an additional internet provider. Keep an active policy of information backups. Define, in advance, contingency procedures and train your people to follow them. Remedy: Hire a consultant to devise the technological and procedural tools needed to ensure information security. Train your staff in the corresponding procedures and monitor them. Risk: Some critical requirement from the client was not recorded in the scope definition of a project, resulting in low customer satisfaction, rework and negative impact on the time and cost objectives. Remedy: Rely on trusted translators. Keep a strong vendor management policy. Maintain good communication channels with them in order to detect problems as soon as possible. Provide and request feedback. Have backup providers to activate them if the designated one drops from the project. Risk management is the tool to proactively manage the uncertain nature of life and work, and it should be part of the toolbox of any organization (including unipersonal ones). Consider the simple approach suggested in this note or deliver your own. Risk awareness and preparation, sensible processes and a focus on learning lessons from errors and problems should be part of any definition of professionalism. This article first appeared in the June 2016 issue of MultiLingual magazine. Reproduced with permission. This is the second post in a five-part series from an article I wrote on this subject for the June 2016 issue of MultiLingual magazine. It is reproduced here with their permission. The first part already published presented general definitions on the issue of risk, while this and the next deal with the generic frameworks provided by the Project Management Institute (PMI) and the ISO 31000 standard . The Project Management Institute (PMI) is, in its own words, “the world’s largest not-for-profit membership association for the project management profession, with more than 700,000 members, credential holders and volunteers in nearly every country in the world”. PMI’s Project Management Body of Knowledge (PMBOK®) is widely recognized in the project management profession. It provides guidelines, best practices and a comprehensive methodology based on five process groups: (1) initiating, (2) planning, (3) executing, (4) monitoring and controlling and (5) closing. These processes are further grouped into ten separate Knowledge Areas, defined as a set of concepts, terms and activities that make up a professional field, project management field or area of specialization. Since project risk management is one of these ten areas, any implementation based on the PMBOK® Guide should take into account the whole picture, although that greatly exceeds the scope of this note. 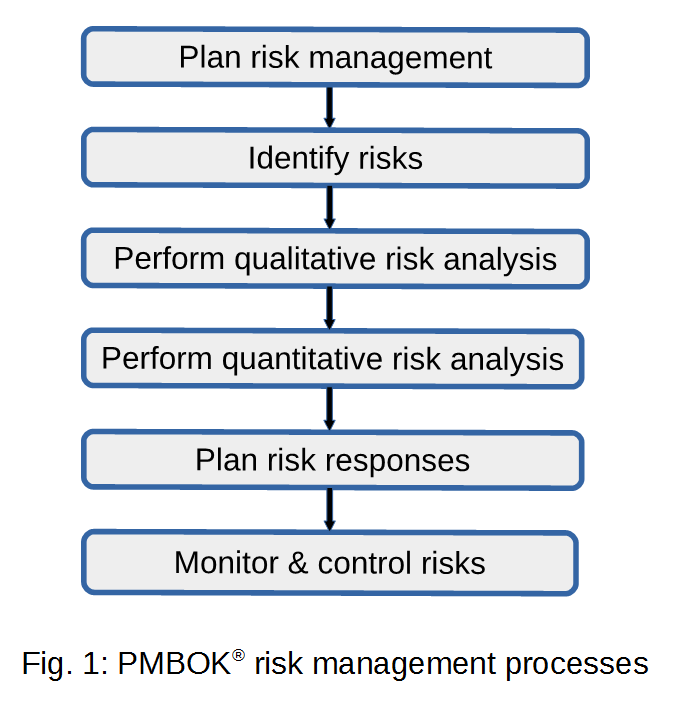 The PMI identifies the six high-level risk management processes presented in the figure 1, where the first 5 belong to the planning group and the last one is a monitoring and controlling process. Note that the processes are represented as a flow, from first to last, due to the fact that projects always have a beginning and an end. The more generic ISO 31000, in contrast, has a “closed loop” topology typically associated with processes. Plan Risk Management is the process of defining how to conduct risk management activities for a project, including methodology, roles, criteria for prioritizing risks and communication policies. Its output is a project risk management plan. This process ensures that risk management efforts are commensurable with both the risks and the importance of the project to the organization. Identify Risks is the process of determining which risks may affect the project and documenting their characteristics, thus providing the knowledge and the ability needed to anticipate events. This is an iterative process, as the risk information may evolve during the project. Its main output is the initial entry into the risk register, a document that will also receive the results of risk analysis and risk response planning. 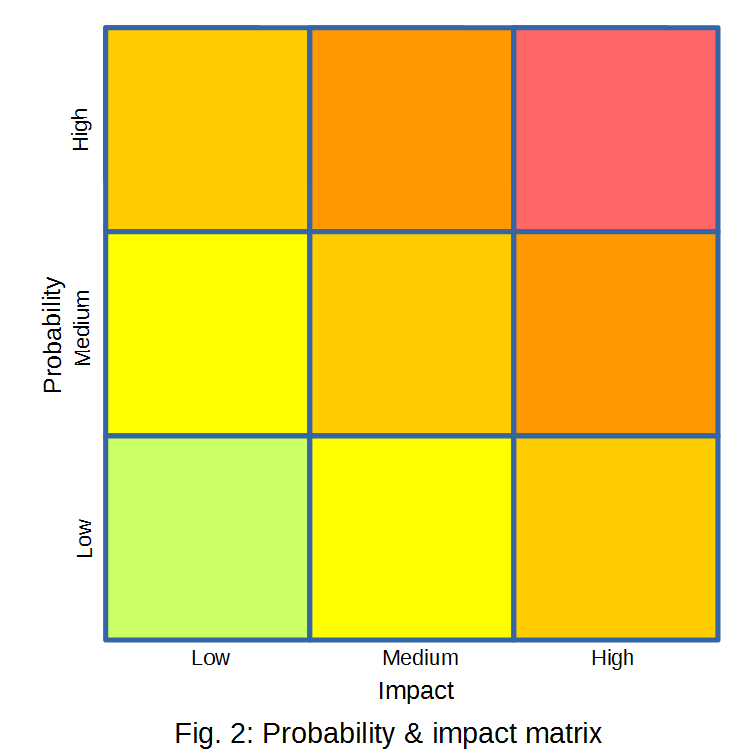 Qualitative Risk Analysis is the process of prioritizing risks for further analysis or action by assessing and combining their probability of occurrence and impact, usually in a matrix as the one presented in Fig. 2. This helps identify the risks that should be actively managed, and it is usually a quick and cost-effective means for the planning of risk responses. Quantitative Risk Analysis is the process of numerically analyzing the effect of identified risks on overall project objectives. Tools may include sensitivity analysis, expected monetary value (EMV) analysis, modeling and simulation. It may not be cost- or time-effective in small projects, where the qualitative analysis may be enough. Avoid: to eliminate the threat or protect the project from its impact usually by modifying the project plan to eliminate the threat entirely, isolating the objectives from the risk impact or changing the compromised objectives. Transfer: to shift the impact of a thread to a third party, together with ownership of the response. Classic examples are insurance and outsourcing. Mitigate: to reduce the probability of occurrence or impact of the risk, for example by adopting simpler processes, conducting more tests or by choosing more reliable suppliers. Accept: to acknowledge the risk without taking any action unless it occurs. It can involve the establishment of a contingency reserve (time, money or resources) to handle the risk. Control Risks is the process of implementing risk response plans, tracking identified risks and identifying new ones, monitoring residual risks and evaluating risk process effectiveness. As a Project Management Professional (PMP)® and in my years working as project manager in the services industry I learned to use risk management as a key tool to prepare for the unexpected. 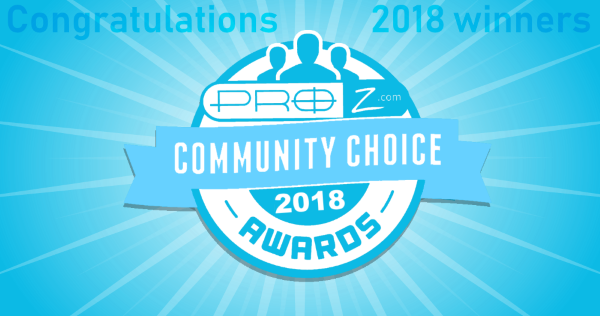 Ten years ago I joined ProZ.com’s team of site staff and discovered the enormous professionalism shared by many translation freelancers and companies. However, I am under the impression that a systematic approach to risk management is not widespread in the language industry and I assembled some notes to help bridge that gap. The following is the first post in a five-part series from an article I wrote on this subject for the June 2016 issue of MultiLingual magazine. It is reproduced here with their permission. Scenario 1: A professional translator reports being scammed by a client. Known contact information on the client turns out to be false. Money is hopelessly lost. Scenario 2: A translation company owner complains that a translator just recruited for a critical job failed to deliver, and as a result the agency lost a good client. Scenario 3: A dispute between a translator and an agency arises after a project is delivered, when it is discovered that the payment method used by the agency is not available in the translator’s country of residence. What do these situations have in common? One or more parties experienced losses and other inconveniences because the circumstances were different than expected, and the problems could have been prevented by asking just a couple of questions at the right time. Welcome to risk management, the professional way of dealing with the uncertainties of the future! This article will present some basic considerations on risk management, two internationally accepted frameworks and an overview of their application in the translation industry, followed by a possible practical approach and some examples. Both in our ordinary lives and in our professional activities we make decisions based on assumptions (statements taken for granted) and predictions (statements about what will happen in the future). The filling of these cognitive gaps is done based on past experience, benchmarking, advice from others or the acceptance of other people’s statements. In practice, many of these variables will not behave in line with our expectations. This can happen because randomness played against us, or we were deceived by our own wishes or by third parties, or maybe because we failed to consider possible deviations from the status quo, or we were simply wrong. In a nutshell, our decisions involve a degree of uncertainty and, as the complexity of our processes and the number of decisions multiply, so do the possible negative impacts of uncertain events or conditions on our objectives, also known as risk. Risks are characterized by their probability of occurrence and the possible impact of their consequences. Risks are always conditional and in the future. Once a negative condition occurs, it is no longer a risk but an issue. Risk management is the process of handling these uncertainties in order to reduce their probability and/or impact, and it defines the difference between reactive firefighting and proactively managing projects and processes. Risk management should be undertaken by all organizations, including the one-person companies otherwise known as freelancers. It requires commitment from the organization’s management, and a systematic approach must be pursued to develop consistent policies and practices. We will present the widely accepted generic frameworks provided by the Project Management Institute (PMI) and the ISO 31000 standard, followed by a discussion on their application in the language industry (and the organizations working in this ecosystem).